Check out this beautiful and quite rare, curved, self-healed, double terminated, Lemurian Agape Crystal from Espirito Santo, Brazil with some unique Time Lines across one of the larger faces that measures 1 7/8x1 1/4x5/8". This Agape Crystal may contain the energies of purple Amethyst, grey Smokey Quartz, milky or clear Quartz, black Rutile needles, ruby-red Lepidocrocite, golden Cacoxenite spears or black Goethite. Upon taking a closer look, we can see a lovely Amethyst phantom, Smokey and clear Quartz, along with splashes of Lepidocrocite and tiny needles of Rutile. We will let our photos reveal these minerals in this beautiful Agape Crystal. It should also be noted here that there may also be tiny abrasions on the surface of the crystal, and, even if some of these minerals are microscopic and not eye-visible within the stone, all of their properties are still within the crystal, as their energies are all indigenous to the area where these crystals are mined. The name "Agape" comes from the Greek word meaning "a continual out-pouring of Creator's unconditional love" upon All the children of Mankind. In addition, the uplifting energies of this potent crystal carry a strong essence of the "phoenix rising" of rebirth, renewal and rejuvenation, and can be a great companion to those who feel that they are facing overwhelming situations. 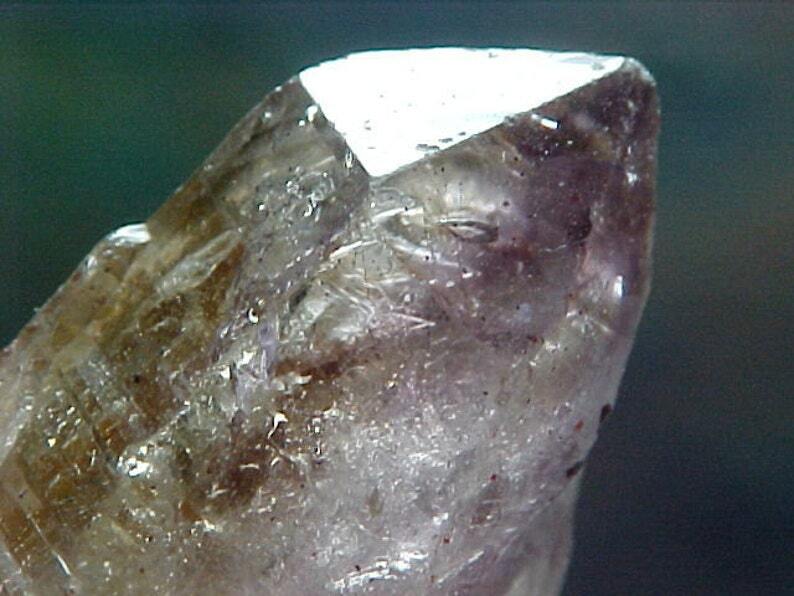 CURVED CRYSTALS are Crystals which have formed a curve while in the process of healing. This configuration is somewhat rare and takes place during the growth stages of the point. They promote "flexibility in attitude" and lend strength and reinforcement to decision making. They are a wonderful companion stone for those who are seeking (and learning) the lessons of tolerance and acceptance, especially in new relationships. DOUBLE TERMINATED CRYSTALS have faceted terminations on both ends and are a wonderful companion stone for all those who work with communication and meditation at all levels, instilling patience, perseverance and completion. They allow the transfer and channeling of energies through both terminations at the same time, making them a superb tool for Reiki and other alternative healing. In their natural form, these crystals have found their perfection apart from the clusters, and remind us that we have the strength, individuality and independence that we need to succeed outside of the group. LEMURIAN SEED CRYSTALS are those crystals which have three alternating, smooth sides and three striated or grooved sides, usually terminating in a triangular face, quite often with a Dow configuration and a Laser Wand appearance. These Crystals may come predominantly from Brazil, but have also been found in Arkansas, Madagascar and Russia (to name a few places) where they are much, much rarer. It is also interesting to note that in Brazil, they are found as separate, single crystals in sand, and here in Arkansas we have seen them on large Clusters where every point was a Lemurian, as well as single points in the tailings. They are said to have been telepathically implanted (indicated by the grooves) with the love, wisdom and peaceful, harmonious ways of Lemuria in order to preserve them for a future time. That time is now, and these incredible crystals are here to lend their assistance in awakening us to peace, abundance and manifestation, helping to bring Mother Earth and all our brothers and sisters into total love and enlightenment. They will be a wonderful companion stone to those who are "awakening" to re-kindle and re-create those sacred ways in order to bring Mother Earth (and all upon her) into universal oneness, as it was in Lemuria. "We share a story of an original community of love that humanity was star-seeded from. This original community is known as Lemuria. Within this community, all beings experienced the flow of love and the sharing of love through an energetic field that was anchored on the Earth. In ancient times on the Earth, the heart chakras were very large within humanity, and all beings’ heart chakras were fed by this universal web of love. This original memory of love is held within every human being within the DNA, and within the heart chakra, all beings have a flame of love that is able to support their hearts to expand and open to the state of consciousness that they felt through their connection to this original community. This state of consciousness is known as oneness. Beloveds, abundance is held within the oneness. And within every soul, there is the blueprint of abundance consciousness, and when it is activated, a soul is able to interconnect energetically with the field of oneness on the Earth, and through doing this, they have unlimited energy to them, and they are able to manifest that which their heart dreams of through focusing energy and channeling it towards the intention of their heart dreams."